New Contributions; an Early Christmas! Bob Dollar of R&W Rope, New Bedford, Mass. has again contributed to the RELIANCE Project; this time, with various sizes of faux manila line (manila fibers do not scale down by 1/6th and thus would not look appropriate). Now all we have to figure out is how to translate 12, 30, 45, 60, 75, and 90 size line (as shown) into real world manila line dimensions. The size of manila line is measured in circumference, while wire rope and new synthetic fiber lines are measured in diameter. 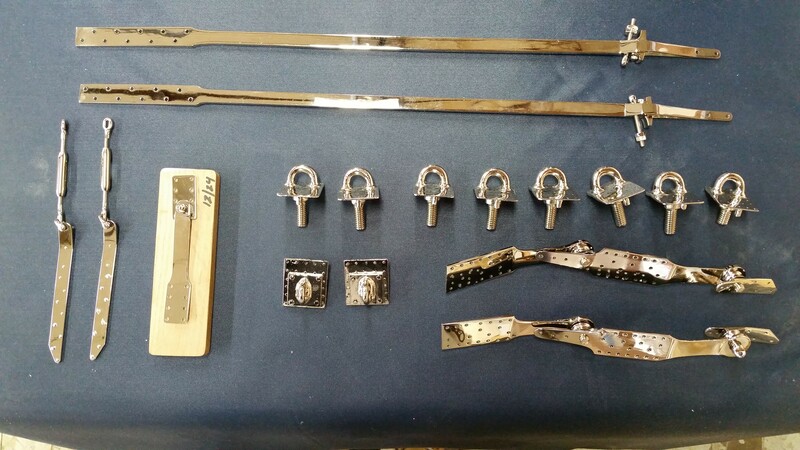 We also just received our first lot of nickel-plated chain plates, staples, and turnbuckles from Tom Perkins of R.E. Sturdy Company in Providence. A number of RELIANCE fittings were nickel steel, but we are limited to casting and shaping brass or bronze. 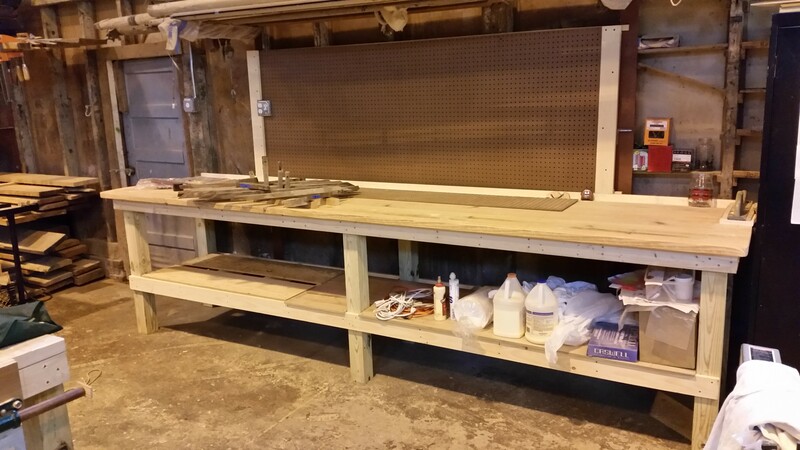 Our “Guy Upstairs” Dave Stewart of Systematics Inc. has been our intermediary for this project, so we do not know who to thank… it was all very hush, hush, so we’ll just thank them both! Burr has also given the RELIANCE Project an early Christmas present! 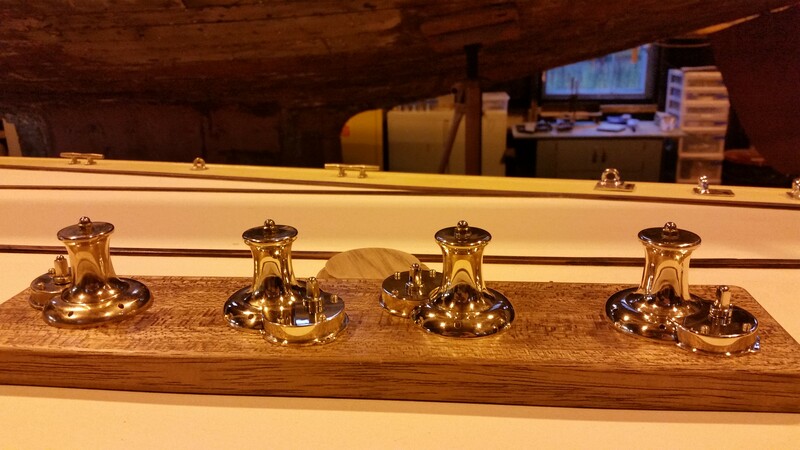 Burr brought over four capstans, three of which go on deck and the fourth onto the boom. Our next step will be to fabricate the teak pads and then fix it in place. 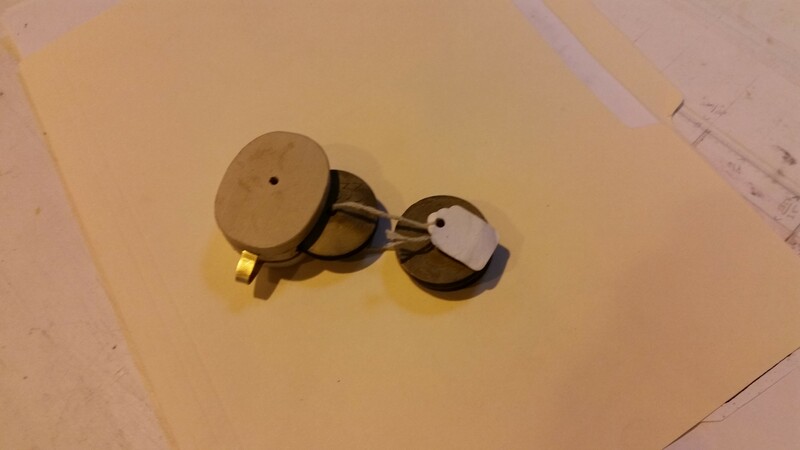 The barrels turn, so we’re a little weary of showing these to Mike–our caster–who are is a miniaturist and clock maker. He’ll probably want to make the internal gears and ratchets! Meanwhile, rigging continues to go well. We’ve been worming, parceling, and serving the galvanized wire every day; hopefully that will be all finished soon. 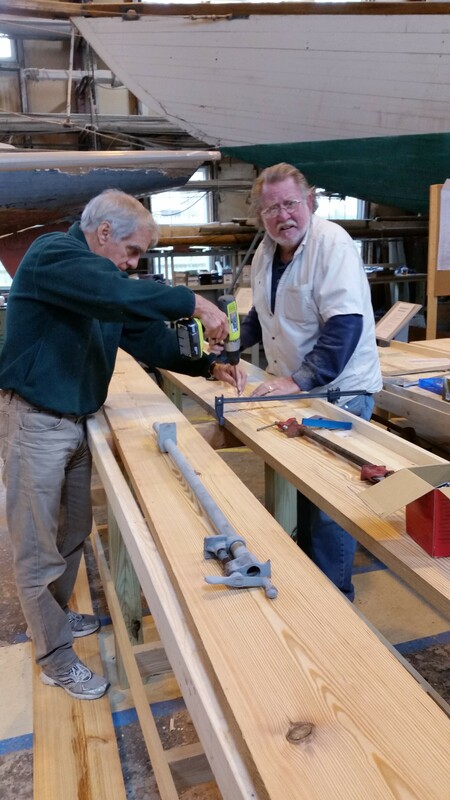 This entry was posted in Project Manager's Welcome and tagged Herreshoff, Herreshoff Marine Museum, lining, manila, parceling, RELIANCE, Reliance Model, RELIANCE Project, rigging, serving, turnbuckles, wiring, worming on November 27, 2014 by Herreshoff Marine Museum/America's Cup Hall of Fame. 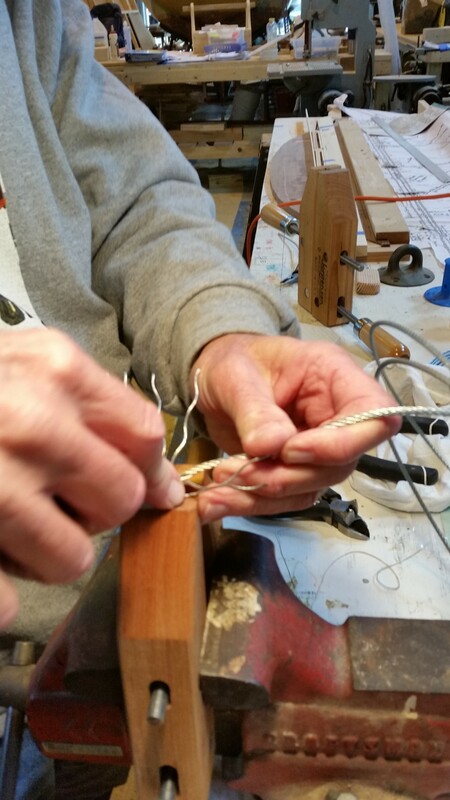 Herb is continuing to develop wire splicing skills as well as passing his knowledge to the rest of the team. 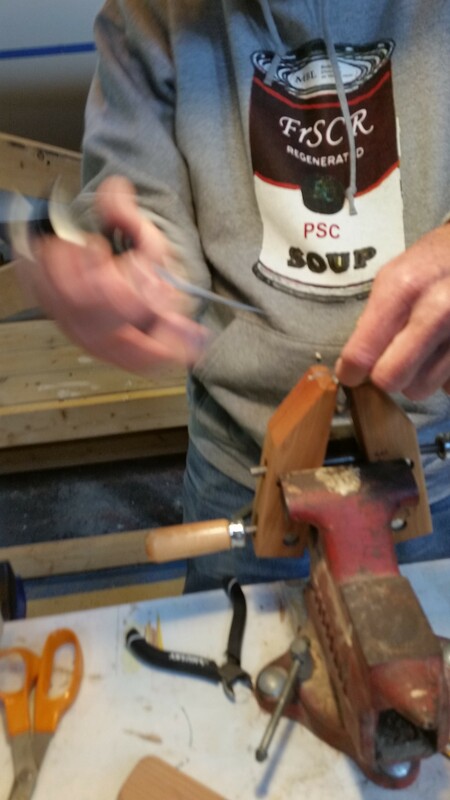 In the photo below, Steve is worming 1/4″ wire for the first of two bobstays. The original RELIANCE used 7 strand Roebling special plow steel wire. In other news, Keith has finished fitting the traveler and is waiting for the paint to dry. 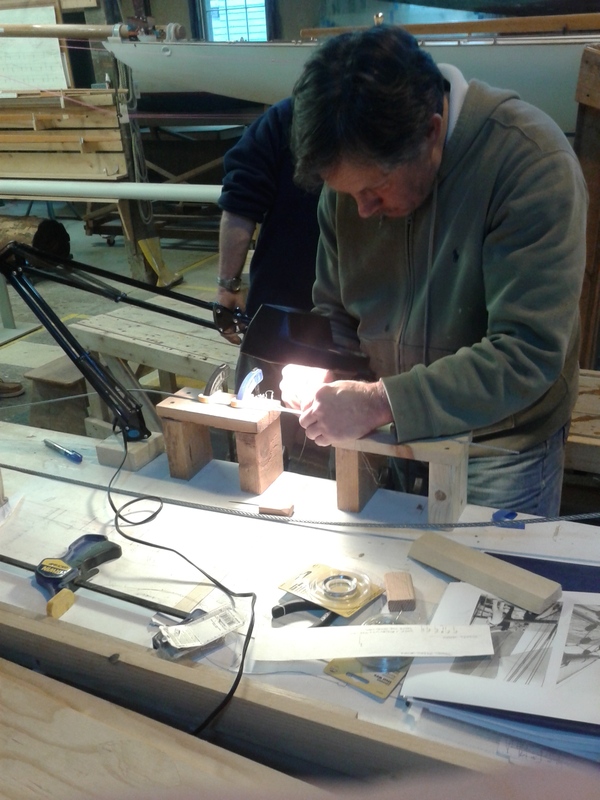 In the meantime, he’s starting to shape the rudder, also seen below. 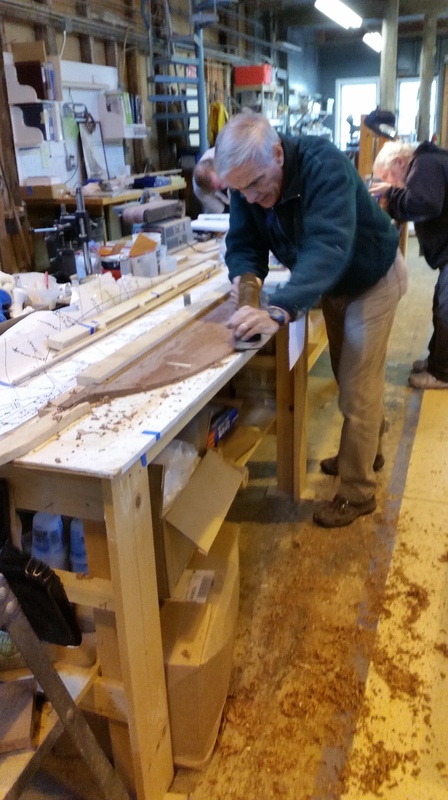 This entry was posted in Project Manager's Welcome and tagged Herreshoff, Herreshoff Marine Museum, RELIANCE, Reliance Model, RELIANCE Project, rudder, splicing, Traveler on November 13, 2014 by Herreshoff Marine Museum/America's Cup Hall of Fame. 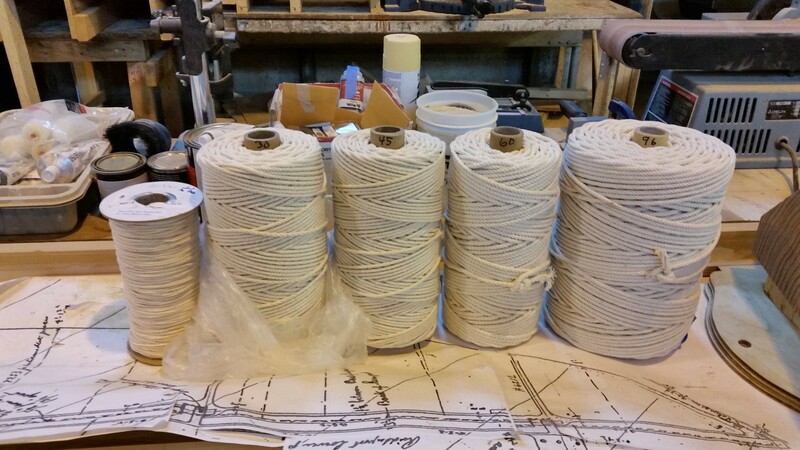 Joe has been scheming to mass produce our 140 blocks (complete with 240 sheaves) of various sizes. Below, we have a 12″ single block–2″ in our scale–and a sheave. 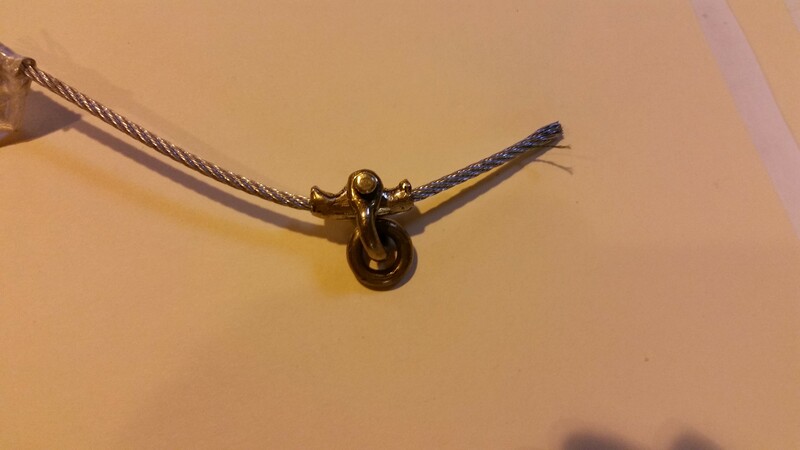 The side view shows the concave hollow for the wire at the top and convex stripper shape at the bottom to stop the wire from going around the sheave twice. The hardest part of this process will probably be forming straps to fit thimbles, straps, and shackles. This entry was posted in Project Manager's Welcome and tagged blocks, Herreshoff, Herreshoff Marine Museum, RELIANCE, RELIANCE Project, sheaves on November 12, 2014 by Herreshoff Marine Museum/America's Cup Hall of Fame. We’re continuing on the massive work we put into building the RELIANCE scale model. Keith and Steve have been working on the Traveler for a while now, and it’s looking like it’ll be finished within the week. As of now, it’s tapped for threads at the ends and pinned at deck level to avoid slipping. Bondo will be used on the access hole that was drilled into the hull to make it seem like it was never there; as of now, the boat is dry fitted and waiting for finalization. 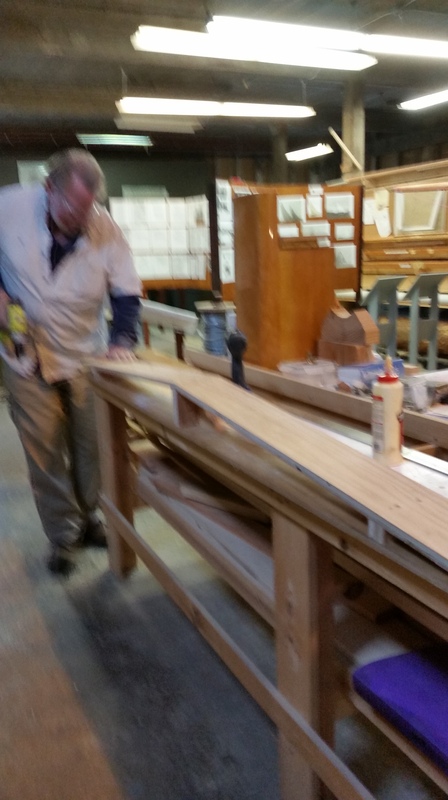 This entry was posted in Project Manager's Welcome and tagged dry fitting, Herreshoff, Herreshoff Marine Museum, RELIANCE Project, Traveler on November 11, 2014 by Herreshoff Marine Museum/America's Cup Hall of Fame. 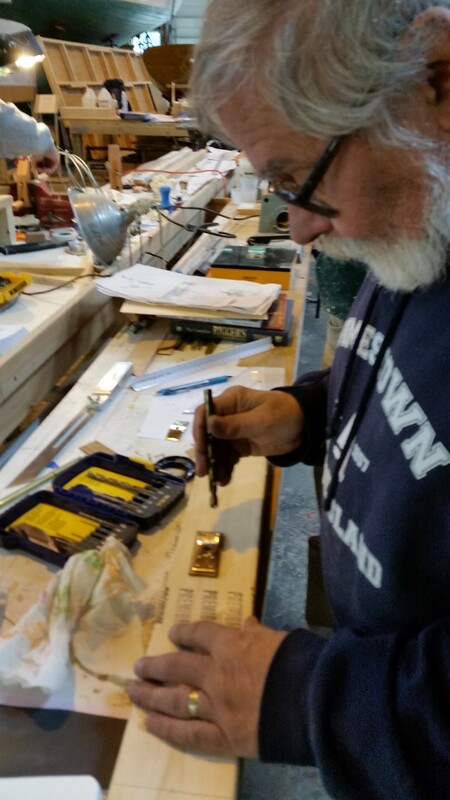 Herb has been honing his rigging skills and has proven the worming, parceling and serving fixtures, and developing tables of lengths for each size of wire. He did the same for the worming, parceling and serving materials. 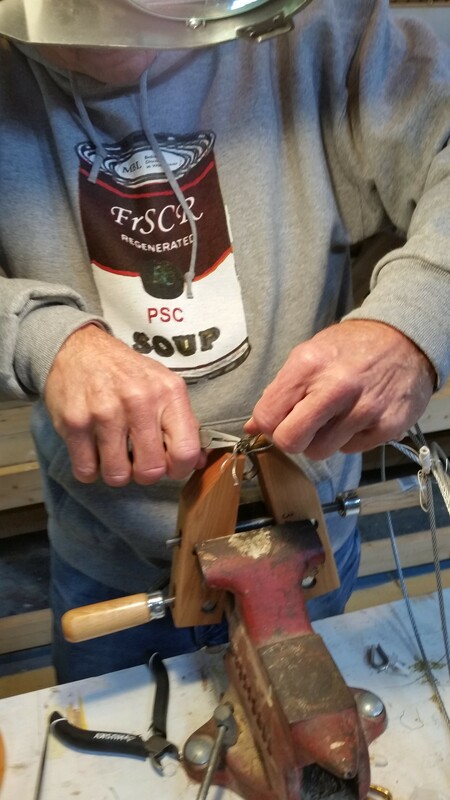 Above, he is seen making a splicing fixture and perfecting his wire splicing techniques. Tim, from the Saturday crew, is following in his footsteps, so we’ll have a production line. Together, they’re completing the two sets of mainsheet span wires, scaled at 10′ long, 1/8″ diameter. The wire is seven strand galvanized steel, just like on the actual RELIANCE (Special Roebling Plow Steel Wire, as in Brooklyn Bridge Roebling). Sandy drilled out some sleeves on the span wire sheet block attachments, also seen above, which Mike had previously cast. 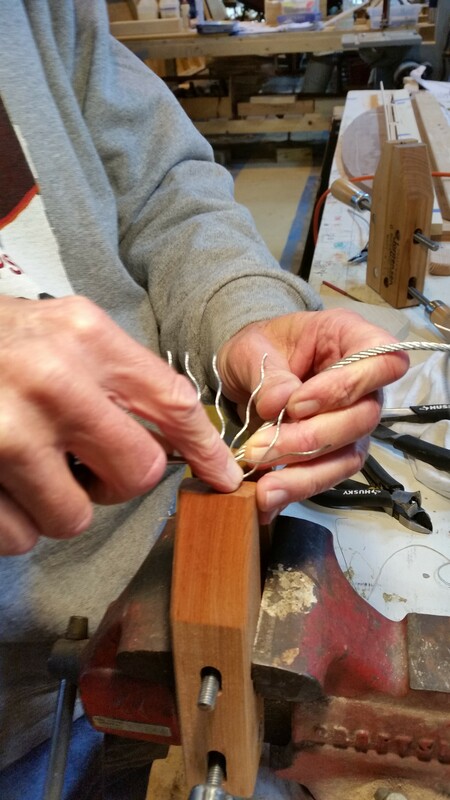 Once completed, the spam wires will be shackled to eyes in straps that Mike has also made. Then we’ll be ready to hang blocks, which Joe is starting to fabricate. This entry was posted in Project Manager's Welcome and tagged America's Cup, Herreshoff, Herreshoff Marine Museum, RELIANCE, RELIANCE Project, rigging, wire on November 9, 2014 by Herreshoff Marine Museum/America's Cup Hall of Fame.